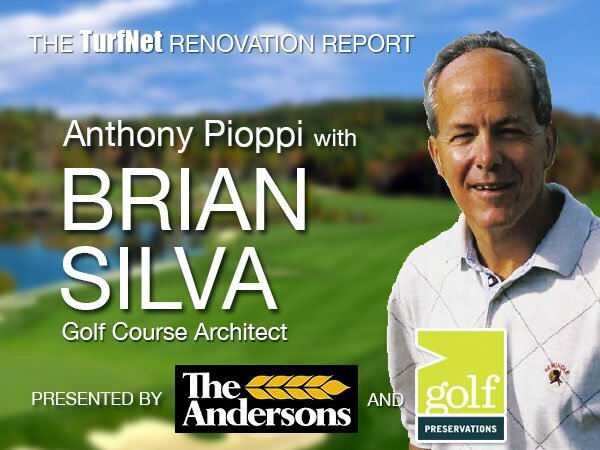 In this episode of the TurfNet Renovation Report -- presented by The Andersons and Golf Preservations -- host Anthony Pioppi chats with golf course architect Brian Silva. The conversation kicks off with Silva's career path from Stockbridge School of Agriculture at UMass (AS in turf management, BS in landscape architecture plus graduate work) to instructor at Lake City Community College, to doing site visits with the USGA Green Section and on to working with noted New England golf course architect Geoffrey Cornish, and ultimately his own firm, Brian Silva Design of Dover, NH. According to the humorous and self-deprecating Silva, "I should be somebody by now with my background." He also notes that some people may need a New England accent interpreter to decipher his half of the conversation. Spend an hour or so with Tony and Brian as they discuss some common sense but often overlooked aspects of golf course architecture and how it affects maintenance, playability and enjoyment of the game.